Download the current WindEYE™ brochure. Turbine magazine was edited and published by Windar Photonics, but includes articles provided by other suppliers from the Danish wind industry as well as Windar's own articles. 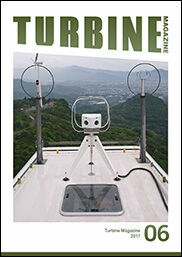 TURBINE 06 is an anthology of Windar's articles published in issues 01-05. Increasing AEP with the nacelle-mounted WindEYE™ LiDAR. Indian Wind Power, August/September Issue, 2017, pp. 7-10.